The goons stood outside their house. Dhaani was concerned, the phone bell rang. Dhaani picked up Viplav’s call, she could not hear him. Dulari cried worried about Dhaani, Viplav was a hope for her still her daughter was not happy. Dasharath came to Dadi bua, she demanded Dasharath to throw Dhaani out of the house before time was over. She complaint how they could not know about Viplav’s wedding with her. Kamini awaited Dhaani in the market, she called Dhaani but could not connect. Her phone bell rang again, she did not pick up the call, then got a message that they had kidnapped Dhaani, and called her to an old compound without informing police. She then called the number, Dhaani cried n was telling Kamini that she did not know where the goons brought her. Dasharath was annoyed at his insult, Dadi came looking for Dhaani. He accused his wife and Viplav for bringing him to that position. Dadi bua came downstairs asking for the biggest lawyer in the town, she wanted to make her will. 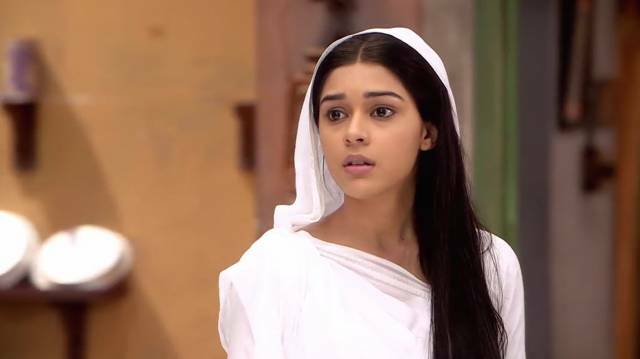 Dhaani argued the goons. The man called Kamini his friend for which he would use Dhaani. He met Kamini in bus, she never picked up his calls. Kamini walked the way panic. She called Viplav on her way for help, it didn’t connect. She stopped an auto in the way. The goon demanded Dhaani to make him and Kamini marry. Dhaani shouted if he had ever seen his face, who would marry him with that face. The auto went out of order, Kamini left her wallet in there as well. Dadi bua did not believe on Dasharath, she had intended to name all the property after him but then since Dhaani was there in the house Dasharath would not get a single penny. She asked him to sign the papers, Dasharath did the signatures saying that time would also pass. Kamini reached the compound. Dhaani shouted at the goons to unwrap her hands. The goon deters them of shouting if there was police around. Kamini asked him to leave Dhaani, he had promised that to her. They would not leave Dhaani, Kamini sweetly spoke to the goons winking at Dhaani. Stay tuned for latest Isq Ka Ranng Safeyd news and updates. Next articleIs Sara Ramirez Leaving Grey’s Anatomy Before Season 12 Finale?